The following table displays data sets relating to Plate Boundaries. The relevant publications and/or news item can be found below. When using these data please cite the relevant publication. Linking rift propagation barriers to excess magmatism at volcanic rifted margins Link to data ( Data links seem to be broken, need to locate resources) Koopman, H., Brune, S., Franke, D. and Breuer. 2014. Linking rift propagation barriers to excess magmatism at volcanic rifted margins. Geology (Pre-Issue Publication 15. Oct), doi: 10.1130/G36085. Long-term interaction between mid-ocean ridges and mantle plumes Link to data Mid-ocean ridge basalts and seismic tomographic data Whittaker, Joanne & C Afonso, J & Masterton, Sheona & Müller, Dietmar & Wessel, Paul & Williams, Simon & Seton, Maria. (2015). 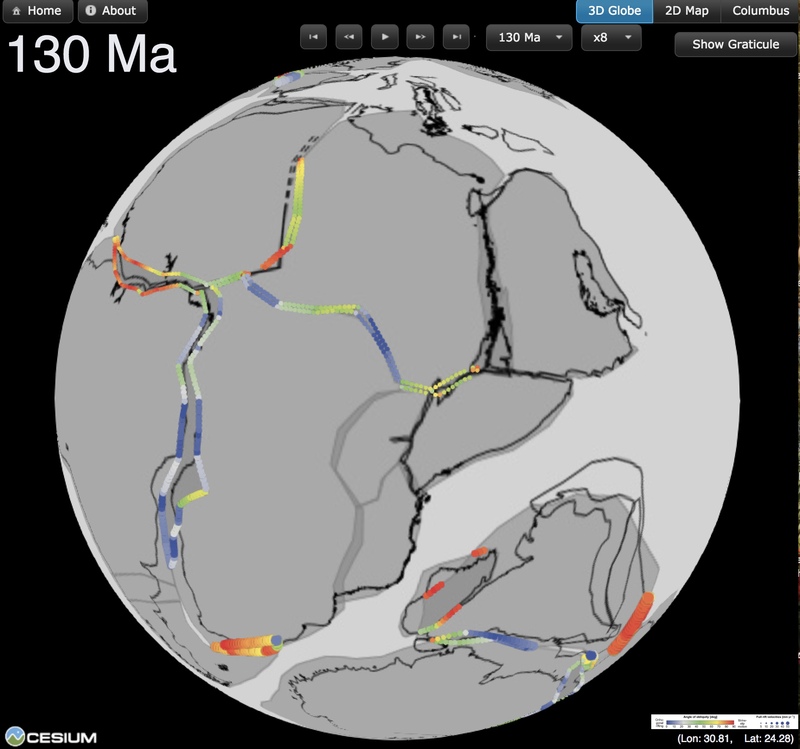 Long-term interaction between mid-ocean ridges and mantle plumes. Nature Geoscience. 8. 25-2015. 10.1038/NGEO2437. Peter Bird (2003) and Nuvel plate boundary datasets Link to data A global set of present plate boundaries on the Earth is presented in digital form - Peter Bird (2003) and Original lon/lat boundaries of plates that was cyber-floating with a NUVEL-1A package received back in 1999; (original source not known) Bird, P. (2003) An updated digital model of plate boundaries, Geochemistry Geophysics Geosystems, 4(3), 1027, doi:10.1029/2001GC000252. 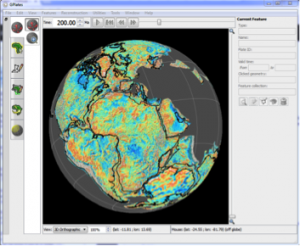 GPlates is a free desktop software for the interactive visualisation of plate-tectonics. The compilation and documentation of GPlates 2.0 data was primarily funded by AuScope National Collaborative Research Infrastructure (NCRIS). Koopman, H., Brune, S., Franke, D. and Breuer. 2014. Linking rift propagation barriers to excess magmatism at volcanic rifted margins . Geology (Pre-Issue Publication 15. Oct), doi: 10.1130/G36085.